Two more games! This was the statement that went out of Nate Brumfield's mouth after their very thrilling game 5 win against the Talk 'n Text Tropang Texters in the PBA Commissioner's Cup 2011 Finals. The Gin Kings win with the score of 100-93. The bench players of Ginebra stepped up in this game. JC Intal looked very cute when he made 2 straight three pointers. Looks like he's looking to take back what used to be his. His minutes in game 6 will sure to increase because of his fine shooting. He also challenged the shots of Paul Harris. He even had 1 block when Harris attacked Caguioa's defense. Intal went from the blind side to swipe the ball out of Harris' hands. Rob Labagala was also huge for the Kings. He pressured Jimmy Alapag very well. Alapag had an early foul trouble and so he needed to sit down on the bench while Ginebra is increasing their lead in the first half. Labagala made a crucial steal in the last 30 seconds of the 4th quarter. Alapag drove to the basket and knowing that Alapag loves to issue a kick out passes to a free three point shooter, Labagala waited like a fox at the free throw line. He was able to anticipate the pass. That's the turning point of the game. For me, this win of Ginebra will boost their confidence and this will also give coach Jong the idea on how to attack and defend Talk 'n Text. Also, they were able to get over the 90 point barrier that TNT has maintained in the last 2 games. Coach Yeng Guiao said that once Ginebra gets over 90 points they will win this series. They should always go beyond that mark. There were two best players in this game. Ginebra closed out well the fourth quarter because of these two players. One is Nate Brufield. 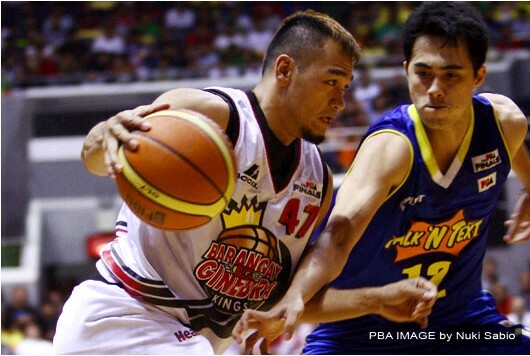 Nate proved to all of us that he deserves the best import award as he scored 26 points and he grabbed 14 rebounds. He had a double-double game. He doesn't want to go home yet. He's also named as the king of rebounds in this game. Kelly Williams just shook his head in disgust while Nate grabbed those big rebounds. Mark Caguioa on the other hand had 20 points and 8 assists. He was burning with confidence in this game. But I noticed that he doesn't want to share the ball to JC Intal in tha last 2 minutes of this game. He should also share the ball so that TNT will have a hard time in guarding them. Intal only had 10 points but he was looking good with those three pointers. Hopefully he'll click again in game 6. Talk 'n Text's two important players were absent in the scoring. Paul Harris only had 15 points and 5 rebounds and Ryan Reyes was not even a factor in this game. He just made 2 free throws and then he left the game because of foul trouble. Reyes must score in game 6 for them to win or else there will be a game 7. Here are the keys for Ginebra in order for them to extend this series. Their bench should play big in game 6. Wilson, Labagala and Intal must do their best for their team. Labagala's shooting was great. He had 2 three pointers and a steal that were very essential for Ginebra. John Wilson's defense against Harris was also great. Harris can't score against this fellow. Mark Caguioa was overflowing with confidence when he said that they beat coach Chot several years ago with the same situation. They were down by two games but they won the next four games to win the championship. Confidence is important for Ginebra. These things and the crowd must be there for Ginebra in game 6 so that the Yellow balloons will stay at the rafters. Game 6 will be on Sunday, May 8,2011 at 6p.m.